Johann Friedrich Blanck was born in Germany circa 1747. He married Anna Catherine Tielbar (Thielbar). Johann Friedrich had five children. It is not certain that Anna Tielbar was the mother of these children. Johann Friedrich died in Lehe, Germany in 1827. According to his death record in Lehe Germany, Johann Friedrich Blanck, linenweaver, was born April 13, 1747. His parents are not known. Not listed in LDS IGI. There is a break in the LDS records for Lehe from 1746 to 1751. It is possible that Johann Frederich Blanck was born in Lehe during that period. Johann Friedrick Blanck married Anna Catherine Tielbar (or Thielbar). The date and place of their marriage are not known. According to her death record, Anne Tielbar Blanck was born September 18, 1750. In 1768 the wife of Johann Friedrick Blanck was listed as Anna. Unfortunately, no surname was given. The first time Anna's surname was listed was in 1788. Because no surname was listed at the baptism of Johann's son, Johann Gottfried in 1768 and the baptismal records for his sons, Johann Freidrich and Gerhard, were not found, it is not certain that Anna Catherine Tielbar was the mother of Johann Gottfried, Johann Friedrich and Gerhard Blanck. The only record for Thielbar in the Lehe records form 1827-1875 according to Die Einwohner des Fleckes Lehe was: The October/November 1875 marriage of Johann Heinrich Dietrich Theilbahr, Maurer, Lehe (son of Diedtrich Heinrich Tiebar, Halbkothner and Sophie Margarethe Antholz) born Hoyerhangen, 10.2.1848 married Maire Sophia Henriette Kramer Stocksdorf (daughter of Christian Heinrich Kramer hausling and Anna Adelheid Neuaus) born Stocksdorf 30.8.1852. The first record for Johann Freidrich Blanck in Lehe was the baptism of his son, Johann Gottfried in 1768. Johann Friedrick Blanck had at least five children between 1768 and 1789: Joohann Gottfried 1768, Johann Friedrich c 1774, Gerhard c 1777, Johann Christopher 1788, and Jurgen Christopher 1789. However, I have only found the baptismal records for three of them (Johann Gottfried, 1768, Johann Christopher, 1788, and Jurgen Christopher, 1789) in the Lutheran Church in Lehe. The breaks of 6 years between Johann Gottfired and Johann Friedrich and 11 years between Johann Friedrich and Johann Christopher probably means other children were born to Johann Friedrich senior. Johann Gottfried , the son of Johann Friedrich Blanck "vulgo Blanck" linenweaver, Burger (citizen), Lehe and his wife, Anne Catherine Tielbar , born October 22, and baptized on October 23, 1768. Note: The wife was only listed as Anna. This could have been Anna Tielbar. Marriage: "Youngman" Johann Gottfried, son of ____ and linenweaver, Friedrich Blanck, married Ilsabe Schriver, daughter of Hienrich Schriver on November 3, 1814. Die Einwohner des Fleckens Lehe 1827-1875: Ilsabe was the daughter of Hinrich Schrieber of Bederkesa and Sophie Alheit Rabbensborg born Bederkesa 8.3.1785. They had at least five children. Johann Friderich Blanck was born July 19 and baptized on July 30, 1815. Witnesses: Joh. Hein. Christ. Rosenboum, Gerhard Blanck, Joh. christ. Amme, Anne Knacken (?) and Catherine Schrieber. Death: Johann Friderich Blanck, age 3 years, was buried on July 30, 1818. Birth: Heinrich Blanck was born May 15 and baptized on May 31, 1818, the son of linenweaver, Johann Gottfried Blanck and Ilsabe, nee Schriever. Witnesses: Johann Neumann, Christopher Blanck, Peter Neumann, Herman Neumann, Madame (?) Mahler, Ilsabe Neumans __ Henrich Neumanns. Heinrich was confirmed on April 8, 1833. Marriage: Linenweaver, Heinrich Blanck, son of linenweaver, Johann Gottfried Blanck and Ilsabe, nee Schriever, married Margarethe Elisabeth Schultz, daughter of ___ Heinrich Schultz and his wife, Dorothe, nee Sanders. on December 1, 1843. Gottfried Heinrich, the son of linenweaver, Heinrich Blanck and Margarethe Elisabeth Schulz was born on October 13 and baptized on November 22, 1844. Witnesses: Johann Gottfried Blanck, can't read rest. Birth: Ana Catharina, the daughter of linenweaver, Johann Gottfried Blanck and Ilsobe, nee Schriever, was born September 1 and baptized on September 14, 1820. Witnesses: Alrich Wohlonen, Heinrich Schriver, Anna Catherina Blanck, Catherina Blanck and ____ Christine Meyerhofts. Anna Catherina Blanck was confirmed on March 27, 1836. Child: Anna Catherine Blanck the daughter of Gottfried Blanck had a child, Marie Prudenka, born on February 5 and baptized on March 6, 1842. The birth was listed under illegitimate births. The father was listed as linenweaver, Johann Jacob Peter Rober. Marriage: Anna Catherina Blanck, the daughter of Johann Gottfreid Blanck and Ilsabe Schriever married Jacob Rober, the son of Johann Jacob Rober and Margerethe nee (can't read) on October 9, 1842. ✟ Fredericke Rebecca, the daughter of burger and linenweaver, Johann Gottfired Blanck and Ilsabe, nee Schriever, was born on the December 23, 1823 and baptized on January 4, 1824. Witnesses: Georg K____, Friedrick Schriver, Rebecca Muhl. Remarriage of Johann Gottfried Blanck: Johann Gottfried Blanck, widow of Hsabe Schriver, son of Fredrich Blanck and Anna Catherine "Tilebaas" married Anna Catherine Fischer, daughter of Claus Fischer Einwohner, Ueterlande, Grossherzogtum Oldenburg and and Catherine, nee Schmeers, on May 14, 1849. Birth: Johann Frederich Blanck, born no later than 1774. *The name is clearly "Banck". However, there are not that many different names in the Lehe records. There are no other records for "Banck". It is possible that this was a clerical error and the name should have been "Blanck". On the other hand, it is the only record for Johann Freidrich Blanck and his wife, Rebecca Christ Dohe-ers. Birth: Gerhard, born circa 1777. Son of Johann Friedrich Blanck based on marriage record. Gerhard was listed as "the son of Johann Friedrich" at his marriage to Catherine Brunjes in 1804. Gerhard and Catherine had three children between 1808 and 1817. Heinrich Christopher, married and had several children - one of whom (Heinrich) immigrated to Hoboken New Jersey. Remarriage of Gerhard: Gerhard Blanck, widow, married Margarethe Tahnchen. Children: Gerhard and Margarethe had three children between 1829 and 1836. Margarethe died in 1848 and Gerhard died in 1849. See Gerhard Blanck for details. Marriage: Johann Christopher Blanck married Johanna Frederike Scheffern. Christopher, baptized on August 24, 1814. Among the sponsors, Christian Wenzel. Birth: Jurgen Christopher, the son of Johann Friedrich Blanck, linen weaver, and his wife (no name) nee, Thilbar born March 31, and baptized on April 1, 1789, witnesses: L. C. Wedekind, G (?) D Sandkuhl, and M Prigge. Marriage: "Young man" Jurgen Christopher, son of Johann Friderich Blanck, linenweaver, married "Young woman" Ana Neimanns, the daughter of Heinrich Neimanns, on July 31,1818. Johann Heinrich, son of "Christopher" Blanck and "Ilsabe" Neumanns, born on June 13, and baptized on June 15, 1819. Witnesses: Anna Rebecca Werner, B___ Neumanns, Hermann Newmanns, Johann Friedrick Blanck and Richard Prigge. Johann Heinrich was confirmed on March 30, 1834. Johann Friderick Blanck, born on February 6, 1823 and baptized on March 9, 1823. Among the sponsors was Gottfried Blanck. Frederich Blanck was confirmed in April of 1838. Johann Friedrich, of Jorgen Christopher Blanck, and Illsbetha, nee Neumanns, born March 6, and baptized on March 27, 1823 (or 24),. witnesses: ___ Werner, ___ Prigge, Gottfried Blanck. Johann Fredrich Blanck, age 80 years, 4 months and 20 days died on August 29, and was buried on September 2, 1827. Die Einwohner des Fleckens Lehe 1827-1875: Johann Friedrich Blancke, Leinweber, Einwohner, Lehe ✟ 29.8.1827 80 years, 4 months and 20 days, "hitziges Fieber" (bruning fever) married Anna Catherine Tielbbar. Anna Catherine Blanck, nee Thilbar, widow of Joh. Heinrich Blancke, ___ and linenweaver, died April 1, and was buried on April 7, 1831, age 81 years, 6 months and 14 days cause of death "entkraftung" (debilitation). There may be records in Lehe for the Blancks going back to 1740. However, I am having a lot of trouble being sure of the handwriting. The first time the Blancks definitely appeared in the church records in Lehe was in 1766 with the baptism of a child of Johann Gottfried Blanck. There were only a handful of Blanck records in Lehe in the late 1700's. Given the limited population of Blancks at the time, it is highly likely that Johann Gottfried Blanck and Johann Frederich Blanck were related. There was no marriage record listed for Johann Gottfried Blanck. Rebecca Dorothea Blanck, the daughter Johann Gottfried Blanck, word Lohgerber [tanner] Ga-allan , and his wife, Anna, was born January 10 and baptized on January 12, 1766, witnesses, ?ibbe Hammanns, Becke Wedekinds, Hinrich Moris, and Michael Hamman. Note: This is the first record for the name Blanck in Lehe. Johann Gottfried Blanck, the son of Johann Gottfried "Plancke --- cagalo---- [same word as for Johann Friedrich's occupation] and his wife, Anne, was born the November 20 and baptized on November 21, 1769, witnesses, Daniel Martens, Christian Gehre, and Fr. Dupain. Note: Wedekind and Martin were also the names of sponsors of the children of Johann Frederich Blanck. Question: Are Johann Gottfried and Johann Friedrich the same person? In July 2009 Bill Harrison wrote about Nikolaus Blanck and his son Frederick Blanck. Frederick Blanck was born on April 13, 1883 in Lehe, Germany. About 1898, Frederick emigrated to the United States by himself on a steamer, to work for his uncle Fred Roes, in Brooklyn. Members of his grandmother's family, the Spinkens also had a store there. On November 26, 1905, he married Anna Reilly in Ridgewood, N.Y. Fred Roes wife was killed in the General Slocombe disaster, and after he eventually remarried he moved to Ridgefield Park, N. J. Frederick Blanck built a successful delicatessen business in Ridgewood, Brooklyn, and later Queens. Upon retiring, he and his wife moved to Levittown, L.I. He died on October 4, 1973 in New Hyde Park, N.Y. His wife, Anna Reilly, was born on May 2, 1881 in St. Peter's Brooklyn, N.Y. Her parents lived in the Flatbush or Bay Ridge sections of Brooklyn, on Bergen St. She graduated from Erasmus High School. Frieda, b. December 2, 1915, m. Sgt. Roy Friend, June 1943, d. May 30, 1945. During WW-II, Frieda was a WAC. A newspaper clipping dated 6/22/1945 reports that she died in a plane crash in Africa, while on a mission. Nikolaus Blanck was born on August 26, 1852 in Germany. He married Bertha Roes. He worked for a cotton importer. He died on March 23, 1910 in Lehe, Germany. Bernhard, who was killed with his wife during an allied bombing of Germany in WW2-II. They had a son named Helmut who had been sent to the country to be safer. Helmut was adopted by Bernhard's brother Adolf and eventually married a woman named Ingrid. Johann, who was supposed to come to the United States, but had an opportunity in the import/export business his father worked for. Johann started as a clerk and ended up owning the business. One of Johann's sons was (Dr.) Klaus, who then owned the business he got from his father. Since Johann stayed in Germany, his next brother, Frederick, came to the US instead. 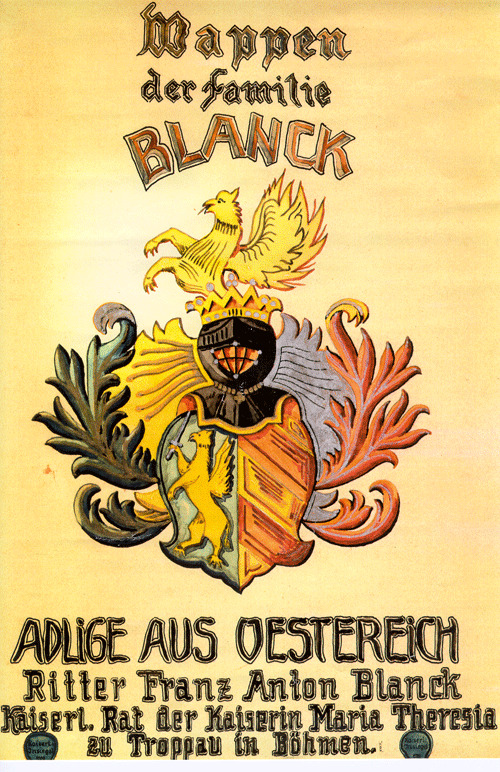 The descendants of Dr. Klaus Blanck now often spell the family name "Blank" instead of "Blanck". They had two boys and two girls (named Elfie (Elfrida?) and Beatrice). Emma, who had a daughter or grand-daughter named Heidi. She died on February 29, 1928 in Lehe, Germany. 1910 Census: 746 Prospect Place Brooklyn, Blank, Frederick W. B., age 27, married 4 years, born Germany, immigrated 1897, naturalized, store salesman delicatessen, Anna F wife age 27, married 4 years 2 children 1 living, born New York, Catherine B age 2, Reilly, Thomas, brother in law, age 27 helper machine shop. 1930 Census: 60-67 Woodbine Street Queens, Blanck, Fredrick Own house $15,000 age 46, married at 21, proprietor delicatessen store, immigrated 1897, naturalized, born Germany, Anna wife age 47 married at 22, Catherine, age 22, journalist newspaper, Emma age 19, Wilhelmina, age 16, Dorothy age 15, Freida age 14, Frederick age 13, Martha age 5, Reilly, Thomas, brother in law, age 46, born New York, occupation "none"
"Arms of the Family Blanck, nobles of Austria. Baronet Franz Anton Blanck, Imperial Advisor to Empress Maria Theresa for Troppau in Bavaria." Troppau is the German name for Opava, a city now in the northern Czech Republic on the Opava River. Opava (Troppau) is the historical capital of Czech Silesia. One interesting fact is that Silesia was taken from Austria by Prussia in 1748. Presumably, after that time Maria Theresa had no further need for a minister to manage Troppau. One can speculate that a family member moved from Austria to Lehe sometime between 1748 and 1817. This can be translated as: "Meaning of the Coat of Arms 'Boldness and Courage' AD 1298. Copied from the original found in the possession the Family Blanck, Laven, near Lehe, Wesermunde"